And then came the cable cars... Yes, that's right, the first serious effort at replacing the horse car railways was done with cable cars. Most people who aren't all that familiar with the history of the trolley are aware of cable cars but they usually are under the impression that they were developed as an answer to the steep grades that couldn't be handled by the electric trolleys. Well the electric trolley had not come into it's own yet but steep grades were still a problem for the horse cars. 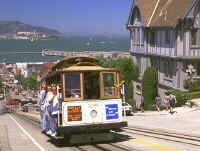 As well, many cities who adopted the use of cable car lines did so because of the new means of power and not because of steep grades. The idea of climbing the steep grades was certainly one of the reasons that a few of them did survive, although today I would think it's more for tourism and nostalgia. Actually, while the cable car was really what I would call the next step in the evolution of the trolley, there were many other attempts to use other methods as well. From wind-up spring drives to compressed air, ammonia gas and even mechanical legs. Steam locomotives were also a choice, but had the disadvantages of the soot, noise and smoke, not well received in the city; as well they caused problems with the horses and carriages that were still using the streets. Steam locomotives were somewhat more costly than the horses. Steam dummies had some success, as did little 4 wheeled locomotives with vertical boilers and using coke or anthracite to lessen the soot and smoke. These little locomotives were generally covered with a body resembling a car so as to appear to be less intrusive. A fireless locomotive was also tried. This was a vehicle that could be described as a steam locomotive without a firebox. The boiler was charged with enough steam to allow the engine to work long enough to get to the end of its route, generally less than 15 miles. Ammonia gas was also tried, with some limited success, in what was also referred to as a fireless car, but in this case it was not a separate locomotive but was contained within the car. Internal combustion w as also tried using naphtha as a fuel. Some battery-operated cars were being tried but the capacity of the battery and the usefulness of the electric motor was not yet at a point of being practical. There were several special purpose incline lifts and there were counterbalance arrangements that were having some success but that's a whole topic in itself. Though many others may have been involved, Andrew Hallidie, a manufacturer of wire rope, is given credit as being the person responsible for the idea of the cable drawn cars. Hallidie, and his wire rope, had already had much success in the use of cable drawn ore cars for use in mines. Hallidie set out to build the first cable car railway on Clay St. in San Francisco. He put all the money he had into it as well as convincing some friends to put some of their money into it and still had to borrow money. All of the underground utilities had to be relocated which amounted to more work and expense than was anticipated but at five o'clock in the morning on August 1, 1873 the first trial run was made on his 2,800 ft railway. On this line he had to deal with grades of almost 20%. As a side note, the story goes that Hallidie, his three partners, along with several city officials were on hand that first morning and once the fog cleared and the fellow who had been assigned to operate the car on it's firs t run, got a better look at the very steep grade decided not to take the chance and resigned on the spot. Hallidie himself took control of the car, tightened the grip, and started down the hill. All went well and repeated runs were made up and down the hill during the morning and later that afternoon the first "official" run was made and the public was allowed to ride the new car, though there were a few minor problems. Despite so many feeling that the cable car would never work, it became an immediate success. The cable car worked on a system that used a continuous cable that ran underground in a conduit, the cable being supported by an elaborate system of sheaves, idlers, and cable guides. A slot between the rails allowed a grip mechanism to reach down to t he cable and when the grip was tightened it grabbed the cable and the car was off and running. The power to run the cable came from a central location. Running at 6 or 8 miles an hour, depending on the system, this was a welcome improvement over the 4 or 5 miles per hour of the horse cars. Cable systems weren't without their own problems through. If the cable became damaged or frayed the entire system had to be shut down while a new piece of cable was spliced in. Likewise replacement of the various sheaves, guides, and idlers would require a shut down. Maintenance was always a headache, especially in the cities where the climate saw ice and snow. Often if a grip encountered a frayed or damaged area of the cable it could not let go of the cable, meaning the car couldn't be stopped until word could be passed to the power station to shut down the entire system. While these types of problems were not too serious on the smaller lines that only had one or two cars and ran short distance, it was a very serious problem on the longer line of some cities. The cable car railways became popular very fast and by the early 1880's there were lines running in many cities across the United States. The systems grew in size and soon saw steam engines as large as 750 horsepower powering them. Denver's system w as said to have used a cable seven miles long. Cables themselves grew in size to diameters of one and a quarter inch to two inches. As the systems grew longer another problem arose. Cables stretch, and as they stretch the tension devices compensate but they can only take up so much. Now the system had to be shut down again while the cable was shortened. Halide's first grip was a winding mechanism but as time went on the grip became operated by a long lever in the middle of the car. The term driver, used in the horse car days to describe the operator was replaced with the term "gripman". The gripman's operation of the levers within the car had much to do with the comfort of the passengers. If the grip was made to fast, the car leapt ahead with a hefty jerk, jarring the passengers. On the other hand if the grip was made to slowly there was excessive wear to the grip mechanism and the cable. As time passed, the speeds of the cars increased as well. Typical speeds were up to 9 miles per hour on city systems and as high as 12 miles per hour on the systems that operated outside the city limits. Certainly not fast by today's standards but a very big improvement over the horse cars. The cable cars often were run using a "trailer" car, allowing the carrying of more passengers. Despite the high costs of construction, the cable car industry continued to grow into the early 1890's and by then there were almost 500 miles of trackage and over 5,000 cars operating throughout the U.S. The larger systems operated in Chicago, San Francisco, St. Louis (55 miles), Denver (44 miles), as well as Washington, New York, Seattle, Providence, Oakland, Baltimore and many others. Chicago's system, opened in 1882, grew to be one of the largest and best systems. During most of this time experiments and improvements was being made to a "new" means of transportation... the electric trolley. By the mid-1890's the electric cars reached a point where they were reliable and the cable systems began to change over to electric trolleys.